SEVENTY weapons including high-powered guns were surrendered to the security forces at Komo in Hela on Wednesday. The two-month moratorium ends next Monday. The weapons included 60 homemade guns and 10 factory made guns. Two tribal groups from the Maia tribe in the Emberali ward and handed over their weapons in what was described as a breakthrough for peace in the resource-rich province. The tribal leaders said most of the weapons they used during tribal fighting were hired from other people. The locals requested the Government to increase police presence in the Komo area to ensure peace and good order prevailed in the community. Hela Governor Francis Potape who attended the peace ceremony with provincial assembly members, said he would pursue their request to ensure a police barracks was built at Komo to look after the Komo and Hides gas areas. Joint Task Force security commanders Chief Supt Samson Kua and Lt Col John Manuai warned that they had all the names of people who were in possession of illegal firearms. They said after the amnesty ends, police and defence personnel would arrest all those in possession of these weapons. 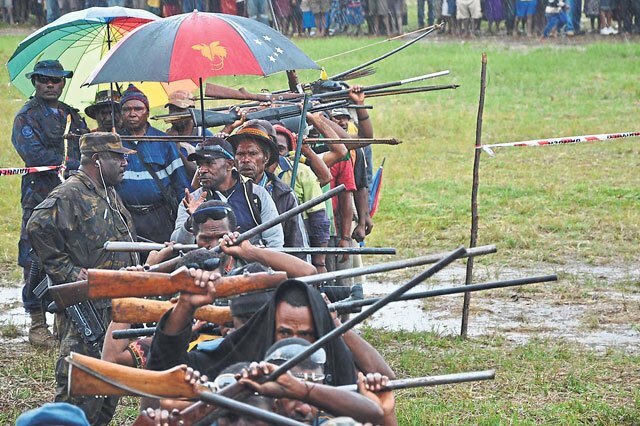 The final gun surrender ceremony is expected to take place in Tari town today with local MP James Marape officiating.